DIE Lunæ, 28 die Januarii. Goodwin versus Isted, in Error. Votes for Relief of French Merchants, whose Goods were seized for being imported contrary to the King's Proclamation. Committees of both House to attend the King with them. Message to H. C. about it;--and with Russell's Bill. Report concerning Trials for Misdemeanors. Message to H. C. concerning it. RobertusComes Lyndsey, Magnus Camerarius Angl. Hodie 2a vice lecta est Billa, "An Act to enable a Sale of Lands, for Payment of the Debts of Henry Kendall Esquire." Hodie 3a vice lecta est Billa, "An Act for granting the Sum of Twelve Hundred Fifty-six Thousand Three Hundred Forty-seven Pounds, Thirteen Shillings, to the King's Majesty, towards the Maintenance of the present War." 1. "An Act for settling the Taxes to be imposed on the Adventurers Lands lying in Bedford Levell, after a Pound Rate." 2. "An Act for settling the Estate of the Lord Norris in Trustees, for the Benefit of the Lord Norris." A Message was brought from the House of Commons, by Mr. Prynn and other; who brought up a Bill, passed the Commons, intituled, "An Act for the Relief of poor Prisoners, and setting them on Work;" to which their Lordships Concurrence is desired. Hodie 1a vice lecta est Billa, "An Act for settling the Estate of the Lord Norris in Trustees, for the Benefit of the Lord Norris." Hodie 1a vice lecta est Billa, "An Act for the Relief of poor Prisoners, and setting of them on Work." The Speaker acquainted the House, "That the Lord Chief Justice of the Court of King's Bench had a Writ of Error to bring into this House." And presently thereupon the Lord Chief Justice brought in the Record, and a Transcript thereof, which was between Thomas Goodwin Plaintiff, and Ambrose Isted Defendant. The said Transcript was presently examined by the Clerk of the Parliament with the Original Record, at the Woolsack by the Speaker; which being done, the Lord Chief Justice carried away the Original Record. The Earl of Dorsett reported, "That the Committee have examined the Remainder of the French Merchants sworn at this Bar on Saturday last, which were intended to have the Benefit of the Votes of the House of Commons, for releasing of their Goods brought from France; and the Committee are fully satisfied, that they are Persons capable of their Lordships Commiseration, to have the Benefit and Relief of those Votes to be presented to His Majesty." 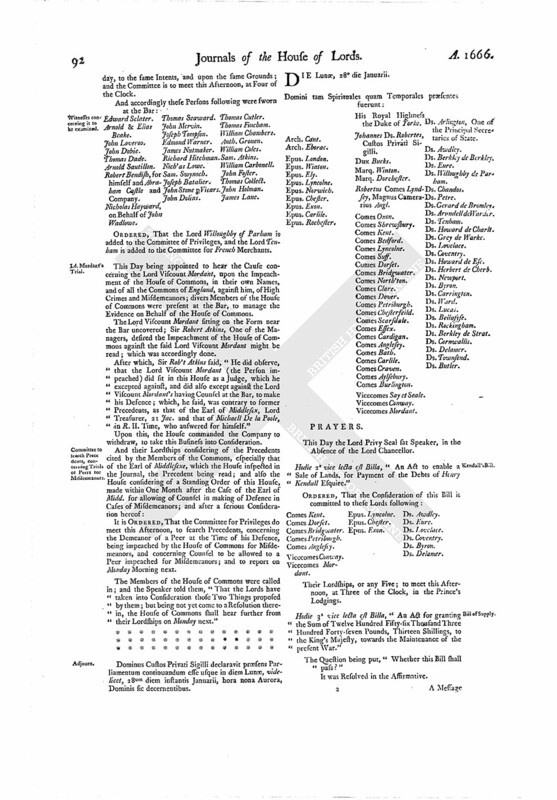 Hereupon the House approved and allowed of these Merchants to have the Benefit of these Votes; and agreed to join with the House of Commons, in presenting those Votes to the King for their Relief. "That both House are satisfied, that the Goods claimed by several Merchants trading to France, now in the Ships, in the List annexed, are the proper Goods of Englishmen; and that no Part of them belong either to French or Dutch, or any of His Majesty's Enemies. "That the said Goods are the Product and Effects of English Commodities; and that there was no Money sent out of England for them. "That all the said Goods were laden in October and early in November last; saving only One Parcel, which was laden the 30th of November. "That both Houses are of Opinion, That the Persons concerned in these Goods are fit Objects of His Majesty's Gracious Favour; and that an Address be made, to present their sad Condition to His Majesty, and to intercede for their Relief. "That Mr. John Wadlow and Mr. Edward Warner, having made out their Case to be the same with the other Persons above-mentioned, be included in the same Address to be made to His Majesty." The Lord Arlington was appointed to wait upon the King, from this House, to know what Time His Majesty will please to appoint, for these Select Committees of both Houses to attend Him, to present this Address to him. To acquaint them, that this House hath passed the Bill for selling a Messuage at Chiswick, for paying the Debts of Edward Russell Esquire; and that their Lordships have passed the Bill of Assessment; and also to let them know, that their Lordships do agree in the Votes concerning the French Merchants, and have appointed Six Lords, to join with a proportionable Number of the House of Commons, to present the same to the King: To that End, their Lordships have sent to the King, to know what Time He will please to appoint; whereof their Lordships will give them Notice. "24 March, 1641. 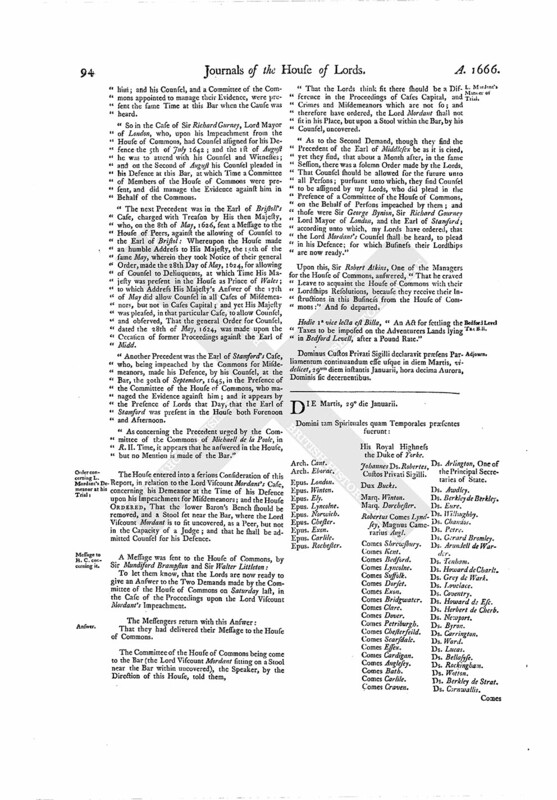 The Judges impeached by the House of Commons, upon their Petition, had Counsel assigned them, for putting in their Answers, and making their Defence. So, the 17th of February, 1641, the King's Attorney General, Sir Edward Herbert, being impeached by the Commons for Misdemeanors, had several Counsel assigned him; and the 9th of March, 1641, when his Cause came to Hearing, Sir Thomas Bedding feild and Sir Thomas Gardiner Recorder of London were committed by this House to The Tower of London, for refusing to be of his Counsel, being assigned. "Another Precedent was the 6th of April, 1642, Sir George Benyon's Case; who, being impeached by the Commons for Misdemeanors, had Counsel assigned him; and his Counsel, and a Committee of the Commons appointed to manage their Evidence, were present the same Time at this Bar when the Cause was heard. "So in the Case of Sir Richard Gurney, Lord Mayor of London, who, upon his Impeachment from the House of Commons, had Counsel assigned for his Defence the 5th of July 1642; and the 1st of August he was to attend with his Counsel and Witnesses; and on the Second of August his Counsel pleaded in his Defence at this Bar, at which Time a Committee of Members of the House of Commons were present, and did manage the Evidence against him in Behalf of the Commons. "The next Precedent was in the Earl of Bristoll's Case, charged with Treason by His then Majesty, who, on the 8th of May, 1626, sent a Message to the House of Peers, against the allowing of Counsel to the Earl of Bristol: Whereupon the House made an humble Address to His Majesty, the 15th of the same May, wherein they took Notice of their general Order, made the 28th Day of May, 1624, for allowing of Counsel to Delinquents, at which Time His Majesty was present in the House as Prince of Wales; to which Address His Majesty's Answer of the 17th of May did allow Counsel in all Cases of Misdemeanors, but not in Cases Capital; and yet His Majesty was pleased, in that particular Case, to allow Counsel, and observed, That the general Order for Counsel, dated the 28th of May, 1624, was made upon the Occasion of former Proceedings against the Earl of Midd. "Another Precedent was the Earl of Stamford's Case, who, being impeached by the Commons for Misdemeanors, made his Defence, by his Counsel, at the Bar, the 30th of September, 1645, in the Presence of the Committee of the House of Commons, who managed the Evidence against him; and it appears by the Presence of Lords that Day, that the Earl of Stamford was present in the House both Forenoon and Afternoon. "As concerning the Precedent urged by the Committee of the Commons of Michaell de la Poole, in R. II. Time, it appears that he answered in the House, but no Mention is made of the Bar." The House entered into a serious Consideration of this Report, in relation to the Lord Viscount Mordant's Case, concerning his Demeanor at the Time of his Defence upon his Impeachment for Misdemeanors; and the House ORDERED, That the lower Baron's Bench should be removed, and a Stool set near the Bar, where the Lord Viscount Mordant is to sit uncovered, as a Peer, but not in the Capacity of a Judge; and that he shall be admitted Counsel for his Defence. To let them know, that the Lords are now ready to give an Answer to the Two Demands made by the Committee of the House of Commons on Saturday last, in the Case of the Proceedings upon the Lord Viscount Mordant's Impeachment. That they had delivered their Message to the House of Commons. "That the Lords think fit there should be a Difference in the Proceedings of Cases Capital, and Crimes and Misdemeanors which are not so; and therefore have ordered, the Lord Mordant shall not sit in his Place, but upon a Stool within the Bar, by his Counsel, uncovered. "As to the Second Demand, though they find the Precedent of the Earl of Middlesex be as it is cited, yet they find, that about a Month after, in the same Session, there was a solemn Order made by the Lords, That Counsel should be allowed for the future unto all Persons; pursuant unto which, they find Counsel to be assigned by my Lords, who did plead in the Presence of a Committee of the House of Commons, on the Behalf of Persons impeached by them; and those were Sir George Bynion, Sir Richard Gourney Lord Mayor of London, and the Earl of Stamford; according unto which, my Lords have ordered, that the Lord Mordant's Counsel shall be heard, to plead in his Defence; for which Business their Lordships are now ready." Upon this, Sir Robert Atkins, One of the Managers for the House of Commons, answered, "That he craved Leave to acquaint the House of Commons with their Lordships Resolutions, because they receive their Instructions in this Business from the House of Commons:" And so departed. 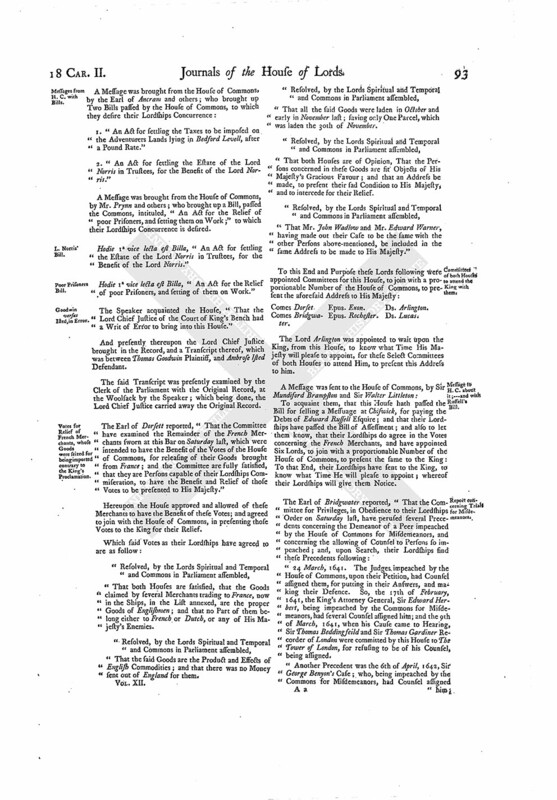 Hodie 1a vice lecta est Billa, "An Act for settling the Taxes to be imposed on the Adventurers Lands lying in Bedford Levell, after a Pound Rate." Dominus Custos Privati Sigilli declaravit præsens Parliamentum continuandum esse usque in diem Martis, videlicet, 29um diem instantis Januarii, hora decima Aurora, Dominis sic decernentibus.